Last week I wrote about how heritage sites and artefacts are sometimes purposely targeted, particularly in times of conflict. Often times, however, heritage locations receive significant damage – or are irrevocably altered – due to natural disasters. Earthquakes, in particular, have damaged or claimed many World Heritage sites. Many regions of Alberta, Canada – including the province’s largest city, Calgary – are currently experiencing heavy rainfall and severe flooding. In addition to the significant damage to public works and private property, many heritage sites and museums in the southern half of the province are in serious peril – if they haven’t been irrevocably damaged already. Sport heritage sites in Calgary have also been severely impacted by the flood. In particular, the Calgary Stampede grounds, home to one of the largest and most prestigious rodeos in the world, and the Saddledome, built for the 1988 Winter Olympics and now home of the National Hockey League’s Calgary Flames, have both been flooded. 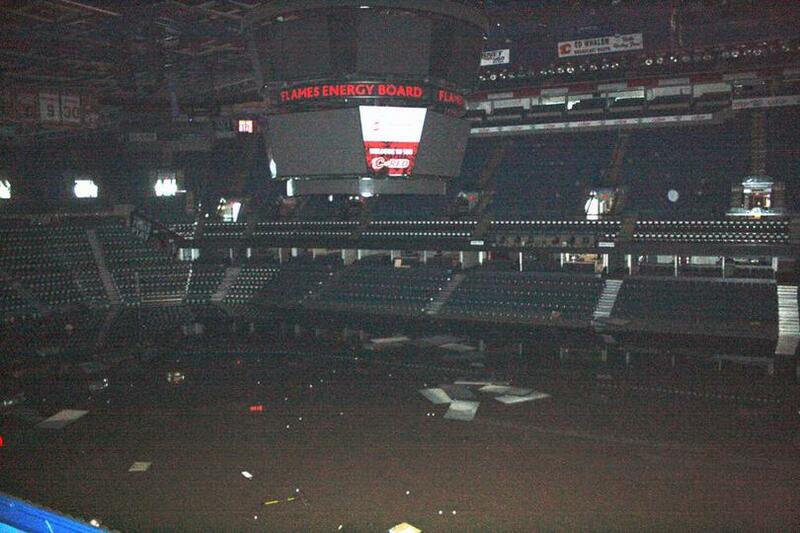 In the case of the Saddledome, reports indicate that most of the lower bowl of the 19,000+ seat arena are under water. Thankfully, sport heritage sites have also become part of the relief effort. Canada Olympic Park – a location discussed in a previous post – is located at a high elevation and has become a shelter and evacuation area for local residents. Of course, the impact of this natural disaster goes far beyond sport heritage. Many lives have been irrevocably altered by the events of the last few days, and it will take some time for the people of Calgary and southern Alberta to recover from this devastating event. On a personal note, I have spent a great deal of time in Calgary over the years and, as a born-and-raised Albertan with many family and friends in that part of the province, my heart goes out to those impacted by the floods. As for what happens to those globally-unique sport heritage locations – I guess we’ll have to wait and see. June 23, 2013 addition: The Calgary Flames added a gallery to their website showing the devastation the floods have caused to the (former) Olympic Saddledome and the surrounding Stampede grounds. The Stampede is set to begin next week and the Flames begin play in September. By Gregory Ramshaw in Uncategorized on June 21, 2013 .